Bowness on Windermere is located on the banks of the Lake Districts most popular lake - Windermere. The village is famous for being one of the regions finest honeypot towns. 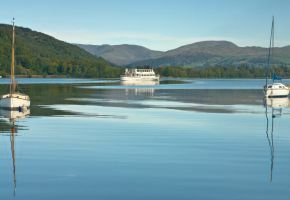 Bowness offers a huge range of activities and accommodation offering a perfect place for visitors to stay. Many boats and steamers use Bowness as a home, and turn Windermere into a prime tourist spot. The large lake plays host to plenty of water activities, including Sailing and Fishing, along with playing host to the Royal Windemere Yacht Club, which offers a perfect sense of atmosphere at the banks of the lake. A number of festivals are hosted throughout the year. the town itself is a perfect mixture of Edwardian and Victorian charm, narrow streets and stunning local architecture. A famous association with the area is of course Beatrix Potter, with "The World of Beatrix Potter" a magical attraction and perfect destination for fans of the hugely popular author. And of course, Bowness is surrounded by plenty of walks, fells and stunning scenery, making it a perfect backdrop for a break in the Lake District.